A swarm of honey bees that are clustered, hanging on a branch or on another object. 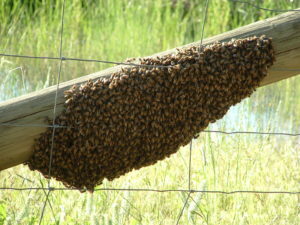 Most often, a swarm of bees is very docile and not a threat. They are in the process of looking for a more permanent home. That said, you should still try not to make them mad by throwing rocks or sticks at the swarm. During the year, a bee colony will get big enough that part of it will swarm, taking the old queen to make sure that their genetics will continue on. Once they swarm from the old colony, the scout bees look for a new home while the rest of the cluster waits. They may only be there for a couple of hours to a few days. These clusters only have a survival rate of about 25%, so if we can find them a good home they’ll have a much better chance. 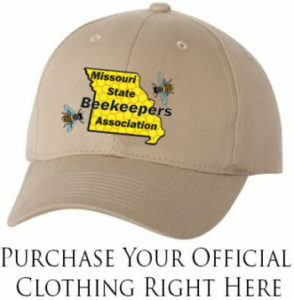 In general, beekeepers do not charge for swarm retrieval. However, if a swarm collection is particularly complicated or multiple trips are required, a beekeeper may require compensation. Please ask your swarm collector ahead of time about their policies. Many beekeepers do not do cut-outs if the bees are located in walls or tree trunks. 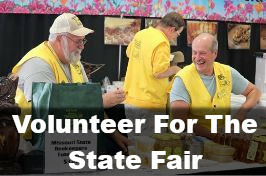 You will need to find one that does this specialty and is insured for it. These are usually not free, due to the time, expense and liability. They are not considered a swarm at this time and have a home to protect. Are the insects definitely honey bees? This is very important. If you’re not sure and you have a cell phone with a camera, try to take a photo of the swarm, or be able to describe the swarm and the insects in detail for the beekeeper. How high up is the swarm? What is the swarm hanging from? Is the swarm easily accessible? How large is the swarm? How long has the swarm been there? 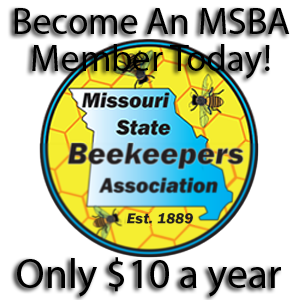 The beekeepers listed here are not endorsed by the Missouri State Beekeepers Association. They are listed here for information only.